A stroll down the streets of New York City is now just an app away from being an immersive experience in preservation history, thanks to Urban Archive, a unique new iPhone app that uses geolocation to display images of historic buildings and sites as the user walks by them. A system of “alerts” keeps the user in sync as he or she proceeds through a neighborhood. Ben Smyth, a multimedia designer who has worked on institutional projects, and Tim Bradley, a board member of the Brooklyn Historical Society (BHS), developed the app together. When they met through a project at BHS, Tim mentioned that he wanted to create an app that would fill a hole in the history sector, and the result is Urban Archive (UA). Together, Ben and Tim worked with three major institutions—the Museum of the City of New York (MCNY), the Brooklyn Historical Society, and the New York Public Library (NYPL), all of which have sizable online collection portals with images of and narratives about thousands of buildings. UA takes metadata from these three institutions and adds its own information. The platform is location-specific; the UA content management system uses block and lot information and attaches UA assets. MCNY, BHS, and NYPL all see their participation in UA as a means not only to share their collections, but also as a way to draw users into their institutions as visitors. At present, there are over 7,000 images on Urban Archive and thousands more will be added. Many provide comparison photographs of a building’s current appearance alongside a photo of how it looked years ago. Right now, the costs of creating the app have limited its use to an iPhone iOS 10 or later operating system, but in the near future, all smart phones will have access. In a recent interview with the New York Preservation Archive Project, Ben explained how UA hopes to be able to assist other, smaller, institutions in bringing their collections relating to historical sites to the app as well. For example, the Queens Historical Society, which recently came on board as a participant, does not have a collection portal, but can work with UA to make the Society’s historical images and narratives available to the public. Other groups such as the New York Transit Museum, the Prospect Park Alliance, the Greenwich Village Society for Historic Preservation, and the NYC LGBT Historic Sites Project can tell their stories related to historic places through the collections of larger institutions via Urban Archive. Ben also spoke of the great promise that UA holds for accumulating important information on the human history behind buildings featured on the app. Currently, there are 2,500 unique location stories on UA; Ben would like to increase these significantly as the project gains speed. He explained how, as a resident of the Lower East Side, he passes so many tenement buildings that hold wonderful stories of the lives of their inhabitants, stories that need to be captured to bring history alive on a level that transcends the limited narratives now in existence. With this concept in mind, Ben and Tim are looking to build out new features on UA, including a two-way dialogue with users to capture these stories. Urban Archive has already created a number of walking tours, and Ben and Tim have confidence that the app will become an important educational tool as well. Ben suggested that someday users could create their own lists of buildings to be viewed for various purposes. For example, a high school teacher in a Brooklyn photography class is using UA to have students use images to tell a story of their own making. 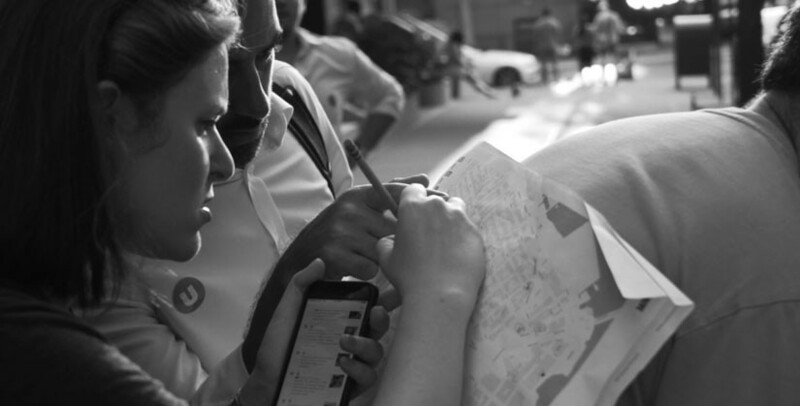 Recently, BHS and UA sponsored scavenger hunts in Brooklyn Heights and Dumbo using the app. Participants were given a clue and then tasked with finding the associated site. The response was gratifying; 62 teenagers were among those who signed up for one hunt. Because UA is still in the developmental stage, Ben and Tim do not have solid metrics yet on user profiles, but they have a strong sense that the largest audience comprises young people—a promising trend for the preservation field. Once UA is more fully developed, Ben and Tim will launch a public relations campaign to elicit general press coverage. At this time, about 2,000 people are testing the app. And while the majority of the images are of locations in Manhattan and Brooklyn, given the nature of the collections of the participating institutions, Ben fully expects that in time, all five boroughs will be amply represented. Urban Archive is a new and timely addition to the resources of historians and preservationists. It is a technological marriage of smart phones with historical images and narratives that shows great promise in creating a new generation of “walkers in the city” who can appreciate, block by block, the buildings that they are passing, and the stories behind those structures.